Police authorities can use custom police magnets to increase their accessibility and visibility without added efforts. 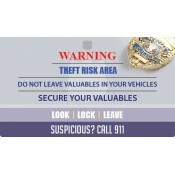 This category features various popular refrigerator magnets and police car magnets that can be ordered by police authorities to improve their public relations. Our price includes art setup, online design proof, shipping and full color printing. Our magnets are made in USA and are lead-free. 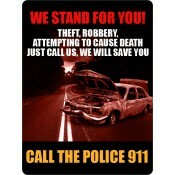 Save on wholesale orders of these customized emergency services magnets. Most people know their local police officials by name and they understand their importance in their life. This does not mean that police officials should assume that everyone knows them and there is no need to devise special ways to reach out to people. It only means that police should even get closer to people and increase their accessibility. Actually, police accessibility helps to strike down crime rates and generates peaceful conditions for citizens. All these years, police departments have organized different police campaigns, community programs and mass events to mingle with people and improve their visibility. 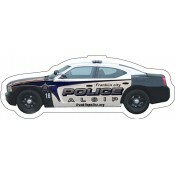 Now they can enhance their visibility by combining their programs with any of these customized police magnets. There is no good and bad time for giving these police refrigerator magnets because people love to receive them always. They will be happier to stick it over their refrigerator doors or working cabinets for better visibility. Police officials can seek individual police department magnets for bulk gifts during tradeshows, community events, special police events and awareness programs. Police car magnets make a great sight. People will stop in streets, crowded places, traffic blocks and other places to read information printed on them. 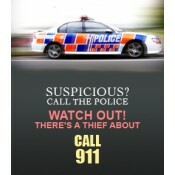 Personalized police refrigerator and car magnets make great fundraising item for police too, too. Additionally, police officials can reach out to the public by bulk mailing colorful police fridge magnets to people in their area. 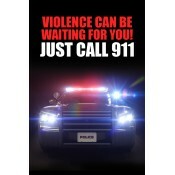 For added impact, they can always combine it with other emergency services magnets in our selection. To know more about imprint, shipping and other details about these personalized magnets, feel free to contact us at 855-762-4638 (Toll Free) or write to us at info@CMagnets.com.